William II, called Rufus because of his ruddy countenance, King of England 1087-1100. 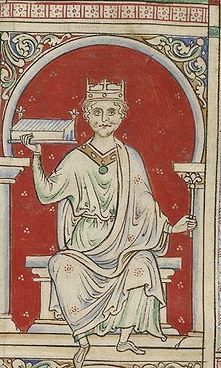 After William I died the newly crowned William II, called Rufus, returned the Earldom of Kent to his uncle and in 1088 Odo showed his gratitude by organizing a rebellion to overthrow William II and replace him with Robert, Duke of Normandy, another son of the Conqueror. When the rebellion failed William II took back Odo’s newly restored earldom and lands and distributed some of the confiscated estates to various barons. Odo was allowed to go to Normandy where he took service with Duke Robert, dying in 1097 at Palermo in Sicily whilst en route to Palestine with Duke Robert to take part in the First Crusade. Amongst those rewarded by William II were the d’Aubigny (also Albini, Albineo, and Albinione) family, one of whom was William, d’Aubigny, known as ‘Pincerna’, Master Butler of the Royal Household. Around 1100 or so Pincerna’s younger brother, Nigel, gave the Manor of Eswalt (Eswala) to his kinsman who was the Abbot of St. Alban’s Abbey in Hertfordshire, possibly to help the Abbey’s finances. Some sources say the Abbot was Nigel’s uncle, others that he was a cousin. William d’Aubigny held Cnoltune (Knolton), which bordered Eswalt, which passed into the possession of the Earls of Arundal through Pincerna’s son, William “Strong Hand” d’Aubigny, 1st Earl of Arundal and 1st Earl of Lincoln. As one of William the Conquerer’s ablest commanders during the conquest of England Nigel had been rewarded with land in Normandy and England and after The Conquerer’s death he served William II Rufus as “Bow Bearer” until the king’s death in a hunting accident in August of 1100. Nigel found favour with William’s successor Henry I, called Beauclerk, when he supported Henry when Robert “Curthose”, the king’s elder brother and the Duke of Normandy, tried to take over the throne after William Rufus’s death. During the Battle of Tinchbray in Normandy in 1106 Nigel captured Curthose and gave him to the king and as reward for this gift Nigel received the English lands of Robert, Baron de Fronteboef, forfeited for supporting Curthose. As further reward for his support of the king Nigel was given all the lands in Normandy and England of Robert de Mowbray, Earl of Northumberland and also Nigel’s uncle, which had been forfeited to the Crown in 1095 for rebellion against William Rufus. Henry also arranged for Nigel to marry Matilda, the wife of Robert de Mowbray, who had obtained an annulment for their marriage. The marriage was childless and in 1118 he divorced Matilda and married Gudred de Gourney, the only child of Gerard de Gournay and Edith, the daughter of William, Earl of Warren and Surrey. Earl William’s wife was Gudred, the daughter of William the Conquerer. Robert de Mowbray was the brother of Nigel’s mother, Amicia de Mowbray, and was imprisoned after his defeat and capture. Some sources state that he was allowed to become a monk at St. Alban’s Abbey and died in 1106, whilst others say he was imprisoned for the rest of his life and died in 1125. With land holdings eventually amounted to some 120 manors in Normandy and 140 or so in England Nigel became a very wealthy and powerful magnate. He had two sons, Roger and Henry, Roger succeeded him and inherited the Mowbray lands and by the special command of King Henry assumed the surname of Mowbray and founded the Mowbray dynasty. Nigel d’Aubigny’s original grant of Eswalt by charter of Henry I was later reconfirmed by charter of King Stephen. In the 1930’s Dr. Hardman, a well respected East Kent historian, translated the charter of King Stephen from the original Latin and by use various indicators in the charter dated it to the early 1140′s. 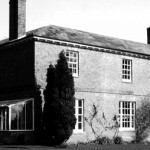 The manor remained in the possession of St. Alban’s Abbey for over four hundred years. Over the centuries the Abbey’s estate had various tenants paying rent and service to the Abbot. In the early 1500’s Thomas Quylter was the tenant and in 1519 he willed his lease to John Hamon, who also had land in the adjoining parishes of Goodnestone and Chillenden. The Hamons, later Hammond, continued as tenants of the Abbey during the 1530′s when Henry VIII began the Dissolution of the Monasteries. In 1539 the Abbot of St. Alban’s sold “Seynte Albons Courte” to Sir Christopher Hales, Master of the Rolls of King Henry VIII., probably to avoid confiscation without payment, with the Hamons as sitting tenants. On Sir Christopher’s death in 1542 his three daughters sold the estate to Alexander Culpepper, who in turn sold it to his brother, Sir Thomas Culpepper, who sold it to Thomas Hammond, the sitting tenant, in 1555 (1556).